The growing of a human has been the special project I mentioned and the finer details have now been confirmed.. we had our 12 week scan (actually dated as 13 weeks though) yesterday and all looks good and healthy! As those of you who've been through pregnancy know, the first few months can be really really REALLY hard... I won't say its been a walk in the park but thankfully I haven't suffered as much as others have done in the initial stages. I've managed to avoid morning sickness and just had occasional feelings of nausea now and again if I don't eat every few hours. I've been getting super tired but as well as all the baby growing I've been doing I also started a new job which involves a fair bit of travel. Thankfully the new role is still in the same company, so no impact on my maternity pay.. phew! Some evenings I've just had to admit defeat and get to bed early or just binge watch Netflix whilst the Mr does all the cooking,cleaning and general upkeep of the house.. He's been amazing actually. Obviously being pregnant and leading on to having a baby is going to be a huge part of my life going forward so I want to talk about my experience on my blog. 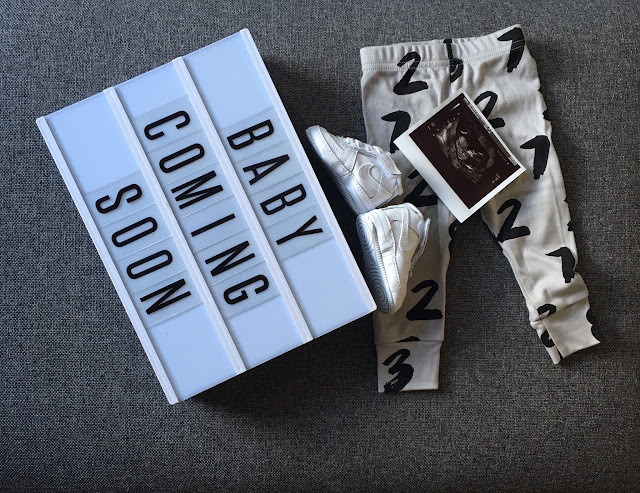 To those who aren't interested in reading about maternity outfits, new kit we buy and general updates you'll be glad to know I am not going turn 100% mummy blogger.. I'm still going to be writing about events I go to, products I love and food of course..when I can face eating anything other than toast or chicken that is! Now that we've come to the end of the first trimester we are starting to get really excited about buying all the essential bits of kit we need for when the baby is here.. we've been eyeing up prams already, thinking about cots and generally just trying to understand what the heck we might need. I've already started a wishlist on Amazon and have been looking through some independent clothing stores for gender neutral pieces; I've seen cute pieces by Tobias and The Bear (their leggings feature in my announcement photo) and Monty And Maude and then some cute nursery decor pieces from Marlowe and Me who are based here in Sheffield. We are moving house soon so once we are all settled in we are going to be able to start decorating the nursery.. OMG it feels so weird typing that.. it still hasn't quite sunk in! Can you recommend any baby products I should check out? Where did you find your best maternity clothing? Tell me everything you know about having a baby!!! Yeay lovely post and so excited! YEY CONGRATS! SO much to prepare for, your gonna be great! Congratulations! I'm so excited for you, so many exciting things to come for you.